Aloha from Sunny Atlanta! (I wish I could substitute Hawai’i for Atlanta, but oh well!) If you weren’t aware, my family and I have spent the past week on a working “vacation” in our old stomping grounds. My driving memory has come back with a vengeance, and every day has been filled with amazing food I really shouldn’t be eating. (I swear, I’m going to end up gaining ten pounds from just a week and a half here!) I’ve gotten to hang out with people who have only become more awesome in my absence. However, trying to pack in everything we want to do and everything we want to see has been exhausting (and perhaps even a little overwhelming). When we finally get home, I’ll be glad to be there. Image 1. Does she look comfortable? But let’s get into what you came for — the next post of Virtual Creation! This post is going to be a short one. Because I’m in Atlanta, I had to prepare all the images last week before we left, at the same time as I prepared the last post. Because of that, this time I’ll be finishing up the scene foreground in preparation for final shading. Mostly, I’ll be arranging and preparing the sunbather. Before doing that, however, I delete the bucket. I had pretty lofty goals of having children playing on the beach, but I’m not sure I’ll get to that. If inspiration strikes and time permits I’ll return to it, but for now I think I’ll concentrate with what I already have. Starting off, I open the content library and begin looking through for an appropriate pose for the sunbather. Basically a pose is a preset arrangement of objects; for a figure, it results in the limbs being distributed in a certain way. Eventually I find a pose that I think might work, and apply it to the figure. With a few tweaks (adjusting an arm here, a knee there), I think the figure looks comfortable. Image 2. I hate it when I forget to take my sunglasses and hair to the beach! 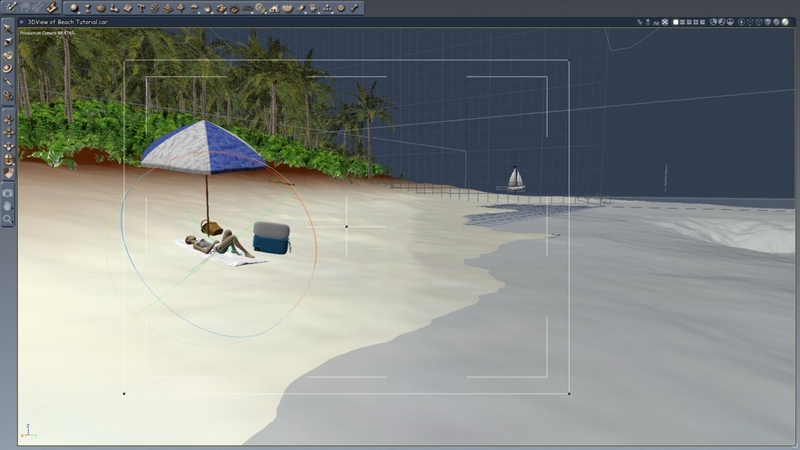 Once the sunbather is posed, the only major thing left to do is the intricate task of shading all the objects in the scene. 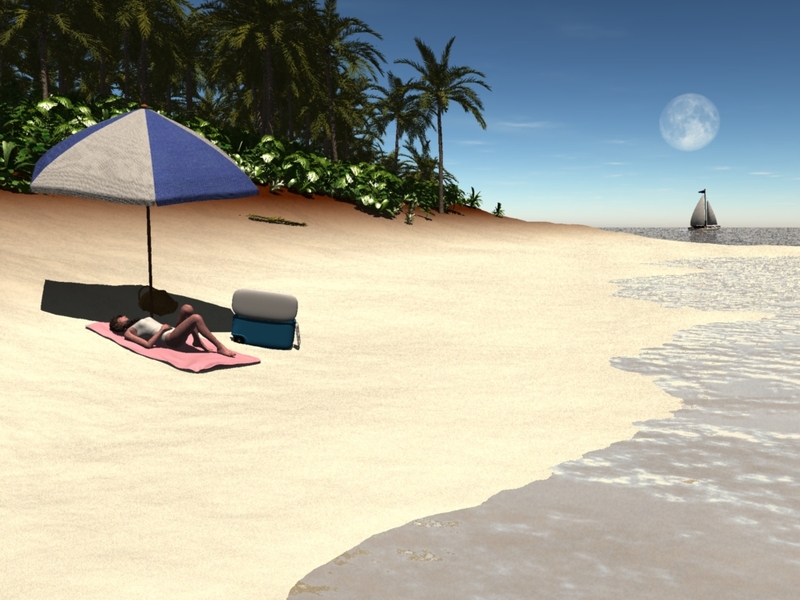 To get the process started I drop a stock shader on the towel, and load a previous skin shader for the sunbather. I also tweak the shader for the hair, just to preemptively fix a few issues that always seem to show up. The render so far weighs in at 1 minute and 27 seconds; this is probably the last post that will have such a short render time. Image 3. Basic shading for the towel and sunbather. This image is almost done at this point. All of the major scene elements are in place (although there’s still a slight chance I might change my mind about adding a kid or two playing further up the beach). From here on out I’ll mostly work on shading to add detail and depth. I’ll also begin to activate some of the more computationally intensive features, like nice shadows and better ambient illumination. Image 4. The Render So Far.